A run in the Hope Valley in the Peak District, followed by a beer, is my idea of a perfect Saturday. I really need to get back on the bike in preparation for Cuba. At the moment though I am waiting for a new gear shifter to arrive and I find it easier to ride with more than one gear! With Jamie and my sister heading off on a 100km audax from Bradwell this weekend I decided to plot myself a little run. 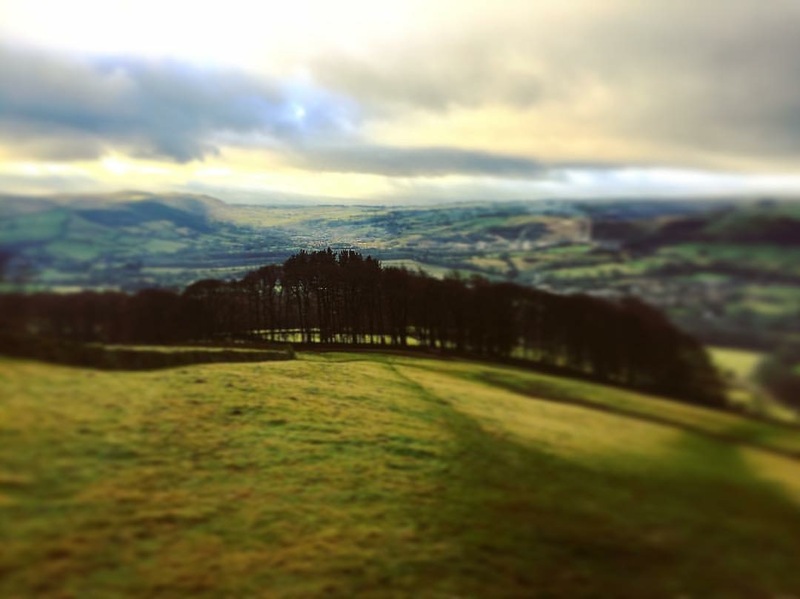 Last year I spent a lot of time running in the Peak District, building up for my first ultra run. I knew my fitness had nose dived since then and I have been ticking over for the last two months. The hard truth is that only way to get fitter is to get out there and push yourself. We stayed at Castleton Youth Hostel on the Friday night. Youth Hostels have changed their image a lot in recent years and can be a fab accommodation option. Great value for money, lots of like minded people and often housed in interesting buildings. This one was no different; Losehill Hall was built in 1882 and is a very grand house. 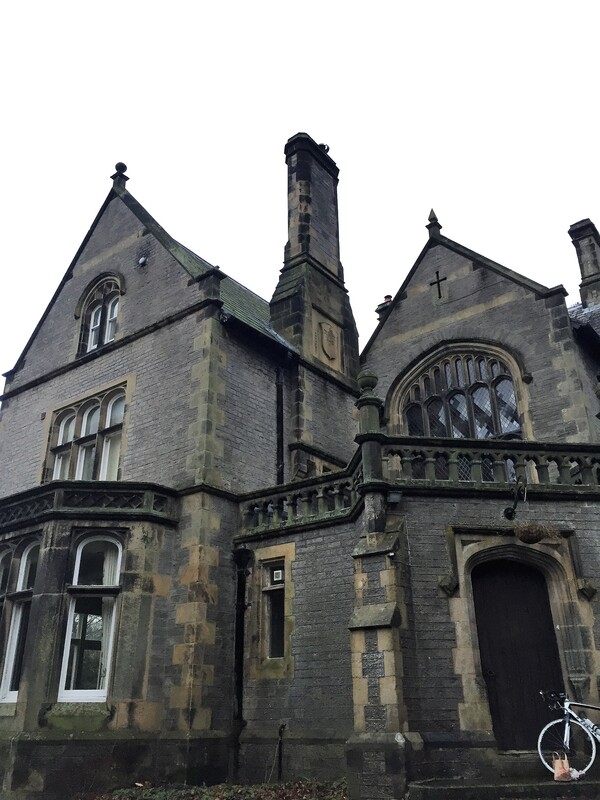 Owned by the Peak District National Park Authority for many years, the YHA took it over in 2012 and have done a grand job of fitting it out. We were impressed to also see that secure bike storage also houses all the tools and kit you need for minor repairs and bike cleaning. We had a cosy evening reading in the lounge – well mainly people watching really before heading for an early night. Let’s Hit The Peak District! Despite the forecast being for thick fog all day, Saturday dawned fairly clear in the Hope Valley. Sian and Jamie headed out on their audax at 9am and I set of on my run. I had planned it to take in the biggest climb near the start. The theory being that it would all seem easier after that; I wasn’t counting on the mud! Jogging my way up slowly up from Aston, towards Win Hill, I overtook some mountain bikers who were struggling to keep their wheels turning on the wet ground. There had clearly been a lot more rain around here recently than we had in Nottingham. Beautiful vistas halfway up Win Hill were quickly obscured by the fog as I climbed higher. The view from Win Hill is a classic. Looking out over the Hope Valley one way and Ladybower Reservoir the other. At times I have found myself alone – save for the odd sheep – at the top, but today a solitary walk er joined me and exchanged pleasantries. After a few minutes the fog lifted enough for me to glimpse the views before I headed back down the other side. The path down was all rocks and mud; a taste of what was to come. I love mud and don’t even mind if I end up on my bum in it as long as I don’t get hurt. This was a whole new level however. 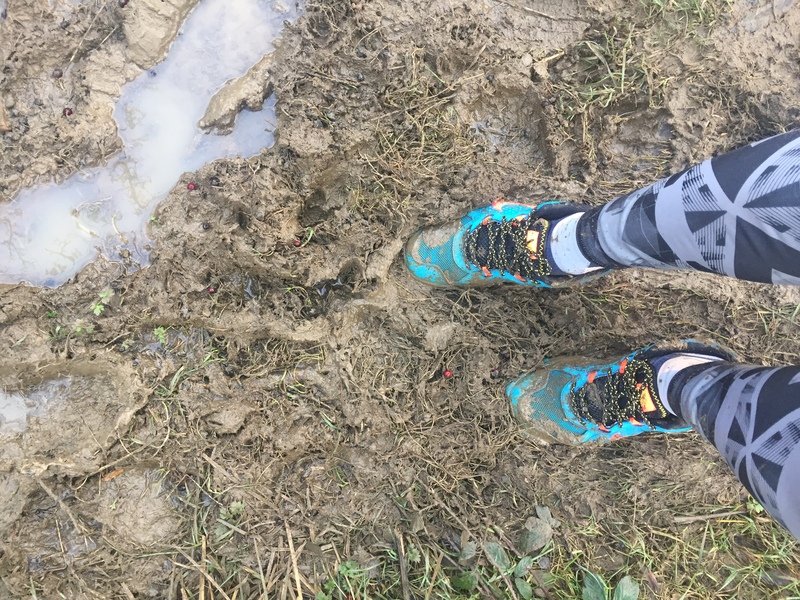 Despite wearing new trail shoes I had no grip and it was so deep and slippy it became impossible to run. Luckily I was in no rush. Sian and Jamie would be out on the bikes for many hours so the best I could do was take my time and enjoy the area. And that’s what I did. I took the pressure off, stopping regularly to look around and take it all in. The temperature was so mild you could afford to stop for a few minutes without freezing. On short stretches it was possible to leave the fields and run on road to cover a little ground. Arriving in Hathersage I couldn’t resist stopping at the Outside Café to grab some flapjack. It was tough not being able to shop the outdoor shops but anything I purchased would have to be carried back! My route back to Bradwell mainly followed the flow of the River Derwent before one last test up the hill at Shatton. 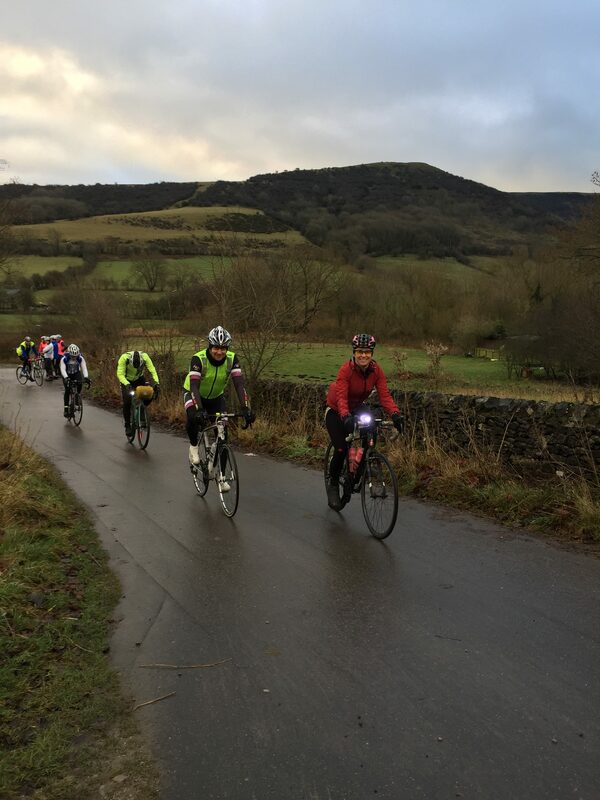 Reaching Bradwell at around 1.30pm to see the first of the audax riders completing their ride. A brief walk to a local pub to wait for Sian and Jamie was necessary to keep warm! I asked for a dark beer and was guided to Farmer’s Belgian Blue, an unusual beer from the local Bradfield Brewery. Belgian Blue does indeed have a blue/purple tinge to it. Run finished, blue beer purchased and notebook out = one happy blogger. Next Post Non Runners Running Group Is Born!